Doing this after a 3-week break, I was struck by the chart looking a lot like the scoring summary of a tight basketball game, only upside down. As the above diagram shows, the temperature balance was pretty close for 7000 years, until the cooling accelerated over the last 3000 years. My light bulb was in seeing that the summer melt is actually the enormous effort by the ocean to recover water trapped as sea ice in the Arctic. The ice extent varies greatly over the centuries and we know from artifacts that it has been both greater and smaller than presently. In this time of global warming alarmism, some of us watching the melt season find ourselves hoping for the ice to gain extent, simply to take away that basis for claiming the end is nigh. Let’s be clear. In this contest between the ice and ocean, we humans should be rooting for the ocean, and so would plants and animals if they knew what was going on. None of us want another ice age, so it is a good thing that the ocean has been gaining on the sea ice extent in the last 150 years. Once again warmists have got it backwards. The Arctic is a canary all right: The more ice there is in September, the closer we are to the next ice age. Open water in the Arctic is a good thing for the ocean and for the planet. So taking off the warmist glasses, we should be cheering as the water extent grows and the ice retreats. We don’t wish for a record low because that would drive the alarmists into a frenzy. Anything around 5M km2 for September would signify nothing unusual is happening, so scary things must be found elsewhere. Maybe the chart should look like this to emphasize the positives of more water, less ice. I am not so naive to think that this perspective has much chance against the warmist PR juggernaut. Already the lessening of Antarctic sea ice this year is trumpeted as proof of CO2 warming, and not a celebration of fresh water added to the ocean. The largest ice cap in the Eurasian Arctic – Austfonna in Svalbard – is 150 miles long with a thousand waterfalls in the summer. Why is it that Greenland is mostly ice and Iceland is mostly green? 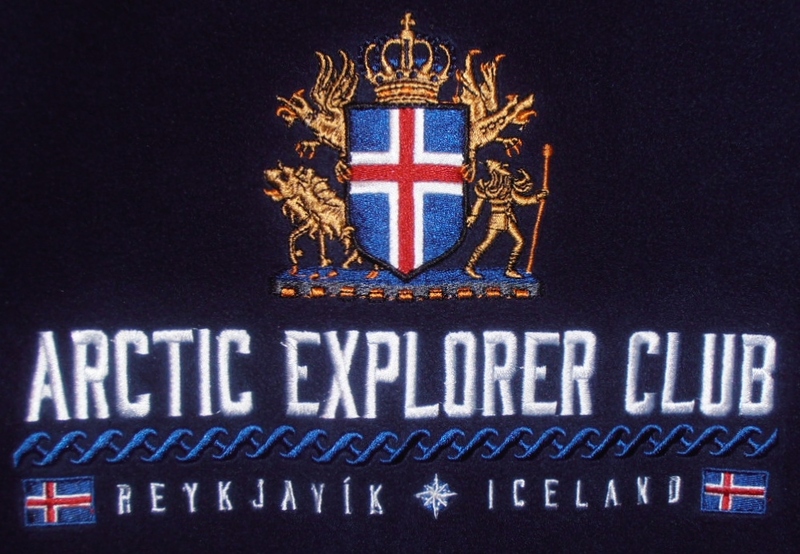 Many explanations have been offered, usually along the lines of deception: Iceland was so called to discourage others from emigrating, and OTOH Greenland was named to attract others to resettle from Iceland. It seems that after a Viking internal power struggle, the loser and his followers could be banished to leave on a ship to find another land, or die at sea. Thus did Leif Ericsson venture from Iceland to Greenland to found a colony, and later to reach Vinland in today’s Newfoundland. 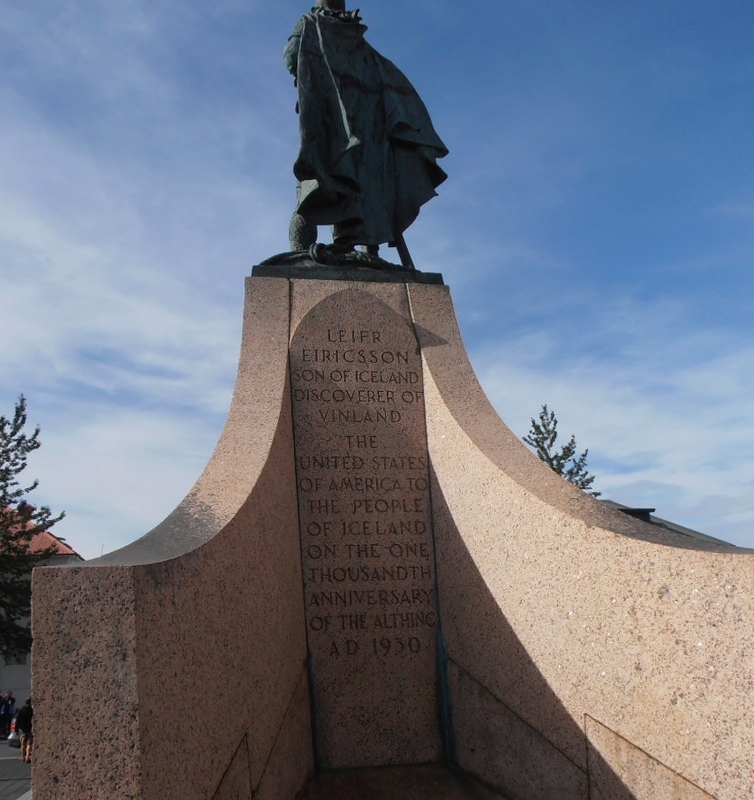 Leif Ericsson memorial in front of Reykjavik cathedral. 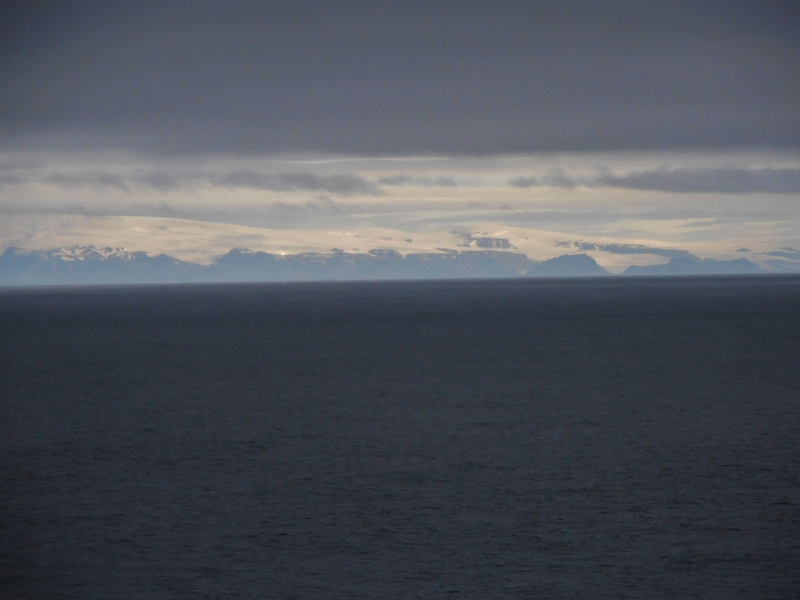 Iceland Glacier August 5, 2015 sailing southeast of Iceland. It happens that the Icelandic glacier sits prominently there, and so, it is land alright, but covered with ice. Of course, later on, they discovered the much more liveable western and southern parts and settled there, but maybe the original name stuck. Meanwhile in Greenland, I was looking for the icecap and was told by our Inuit guide at Paamiut that you have to sail far up the right fjords to see the ice. 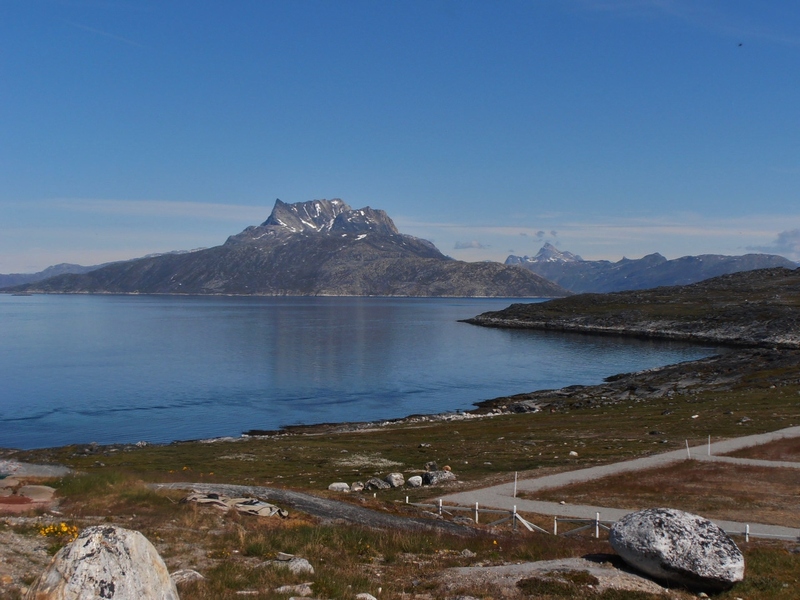 Even though 90% of Greenland is ice-covered, that is not what you see from the shore.